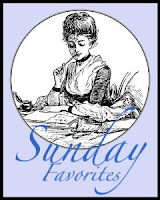 I am joining in with Chari @ Happy to Design for Sunday Favorites. Stop in and see some older posts brought out from the archives to free up some time on a Sunday for other fun things. I first posted this in March of 2009 but I think it is interesting given the weather extremes we are all experiencing now. Today we are very concerned about weather patterns and global warming. There have been abnormal instances of weather in the past too. In 1816 things went terribly wrong and there was nothing anyone could do about it. The normal temperatures in the N.W. United States and in the S. E. of Canada in the late spring were usually around 20-25 degrees Celsius. (68-77 F). Snow in the summer was almost unheard of. Maybe a bit in late May but for the most part never. In May of 1816 most of the crops that were planted were killed off by a frost. Anything that was replanted after that was also destroyed by two snowstorms in June through eastern Canada and New England. There were widespread localized famines and in a weakened state from hunger there were many disease related deaths. There was still lake and river ice in July and August as far south as Pennsylvania. The few crops that did grow to maturity went up in price eightfold. So what caused this you ask? Amazingly enough it was something that happened a year before this. In 1815 in Indonesia the volcano, Mount Tambora, erupted spewing out ash and volcanic dust into the upper atmosphere. During the time frame of 1812-1814 four other major eruptions had already built up the amount of atmospheric dust. When this happens there is a drop in temperatures world wide. There were food riots, flooding. Hungary reported brown snow and Italy had red snow throughout the year. I know we had so much snow in our area this year. Not a normal thing for the Lower Mainland of B.C. Now we have rain and cold temperatures and are about 3 weeks behind the normal pattern. We will have to tough it out and think about how lucky we are. I hear that Mount Redoubt in Alaska has erupted 5 times since yesterday. Uh oh. Very interesting Lori, you have really researched this and it is kind of scary though. Let's just hope that it is not going to be a redo of that horrible year for us. Last year was bad enough. What an interesting post, my friend! Wow...to think that there was ice and snow throughout the summer is just crazy! I have never really studied climate or weather...why it does what it does. To think that a volcano erupting...changing weather patterns so much is interesting indeed! Oooh...and can you even imagine seeing "red snow" falling??? That is so odd! I bet those folks were really wondering what in the heck was going on. They just didn't have the knowledge about such things like we do today! Thanks for sharing this interesting post with us for the Sunday Favorites repost party this week, Lori...I loved it!!! Warmest summery wishes, sweet friend! Very interesting!!! The thought of those mountains around here erupting scare the crap out of me. Geeze - I hope our mountains don't start erupting! We are between two! Where did you find all of this great information? Be thankful for your coolness. The rest of the continent is baking. Our summer is cooler here too! Yea! Weather and its causes fascinates me.